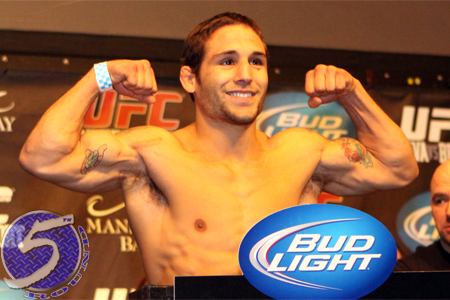 After finishing off his past three opponents in the opening round, former UFC featherweight top contender Chad Mendes (pictured) must have felt like he was working overtime in Saturday’s third round TKO victory over Clay Guida. After patiently measuring Guida in the opening two frames, Mendes saw his opportunity to take “The Carpenter” out in the final frame and capitalized. Mendes became the man to post a (T)KO over Guida in his 10-year career. Mendes wasn’t shy about requesting his next opponent. “Money” wants another crack at reigning 145-pound king Jose Aldo. Of interesting note, Mendes’ last four fights have now ended in knockout fashion. His father was in his corner for all of those devastating finishes. UFC 164 took place inside Bradley Center in Milwaukee, Wisconsin.